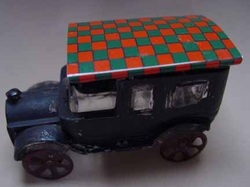 Tin and Cardboard parts are made by Mike Baldwin, contact by tabing name. Members refer to Mike's store in Market place for list of closures, shades and stands available. There are a couple drop down pages if intersted in how parts are made. 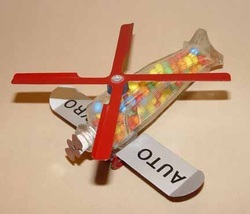 Late in 2001 Terry Knickerbocker challenged Mike to come up with a candy container version of an autogyro. This is Mike's design using the body from an E&A 4 Aircraft by T.H. Stough. All metal parts were created from Mike's design and tooling. 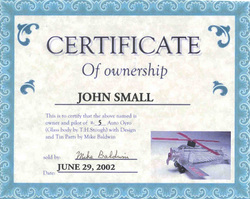 It comes with it's own Owner/Pilot Certificate, numbered, dated and signed by Mike. 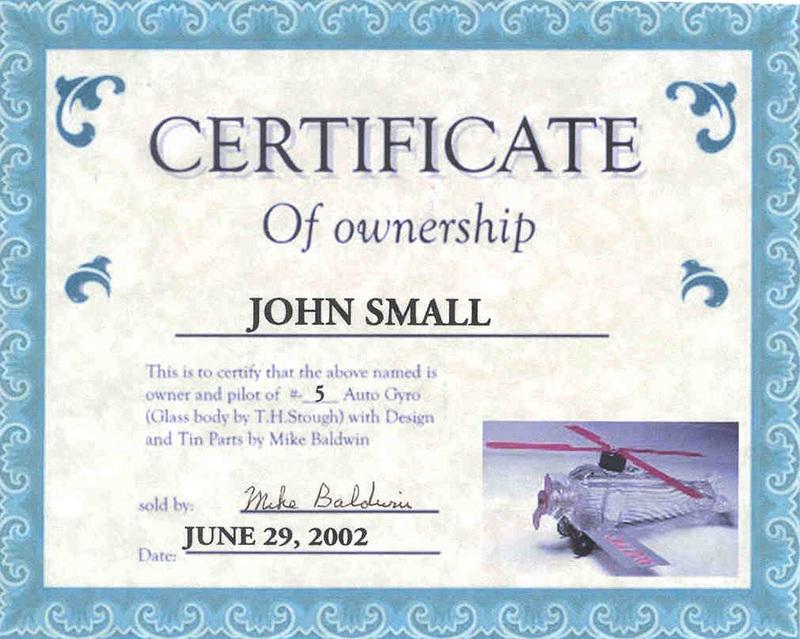 Mike Baldwin, a member of our club makes replacement wheels, miscellaneous parts, airplane parts, display stands, tin closures (auto tops/slide on tops/snap on tops), cardboard and paper parts, lampshades, etc. You can email Mike Baldwin with any questions and for prices. Mike no longer has a Replacement Parts Web Site. During the last Convention in June 2005, while having dinner I asked Mike if he would mind showing how he manufactured the replacement parts. I thought this would be of great interest to members of our club. Mike sent me photos of his shop and a brief description on how he manufactures the replacement parts we all require for our candy containers. Click on the link below to see the story.